For the most recent updates, check my blog. 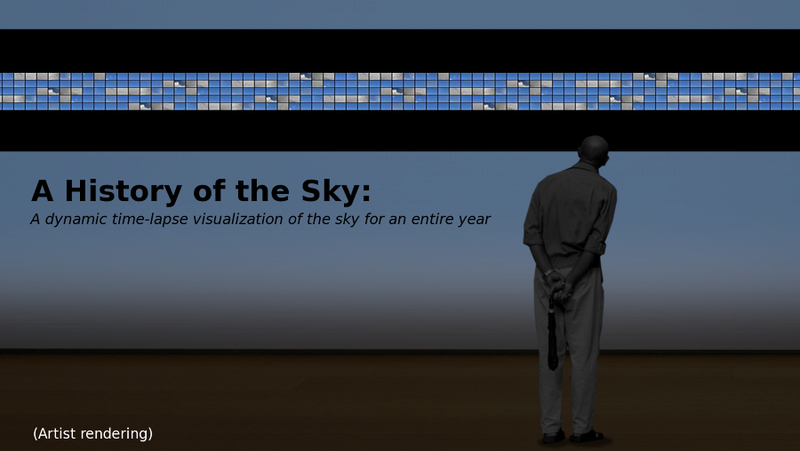 A History of the Sky for One Year:: A full-year version of the project is available online. On July 28, 2010, I reached the one-year milestone, where I've collected images of the sky for a full 365 days. 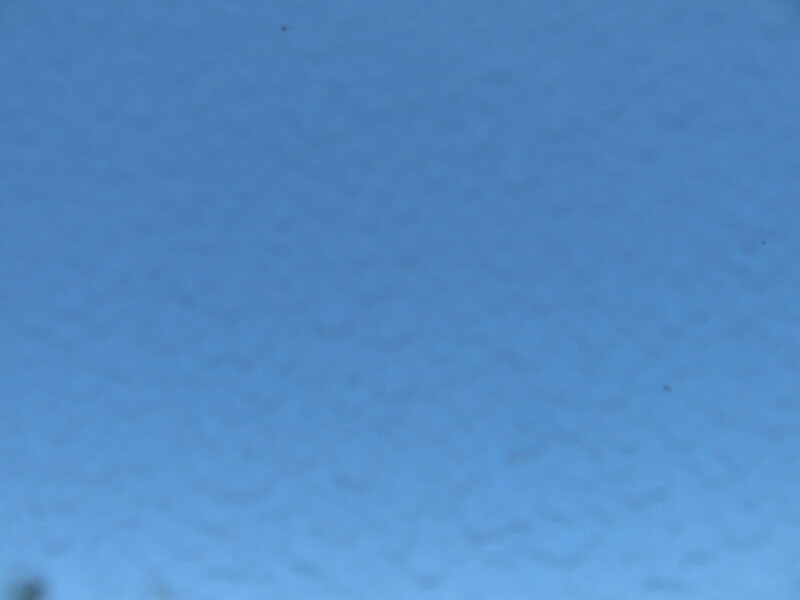 The camera continues to collect images from the roof of the Exploratorium, and I'm now in the process of post-processing the images and building the display. Success! My Kickstarter reached its funding goal. Many thanks to all of you who helped with your support! My project has been awarded the first Bay Area Awesome Foundation grant! I've created a project on Kickstarter where you can purchase these matted prints to help support the project. Help out if you can, and spread the word! Time-lapse movies are compelling because they give us a glimpse of events that are continually occurring around us, but at a rate normally far too slow to for us to observe directly. A History of the Sky enables the viewer to appreciate the rhythms of weather, the lengthening and shortening of days, and other atmospheric events on an immediate aesthetic level: the clouds, fog, wind, and rain form a rich visual texture, and sunrises and sunsets cascade across the screen. This is a work in progress. 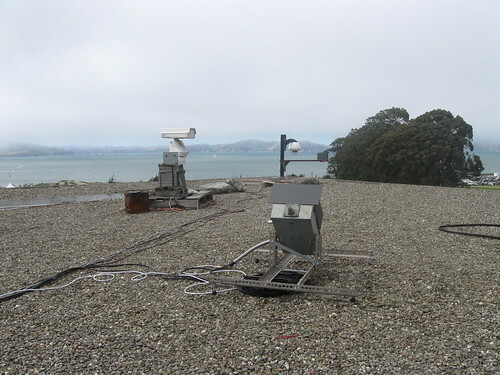 Currently, an image of the sky is being captured every 10 seconds from a camera installed on the roof of the Exploratorium, on the edge of San Francisco Bay. The images collected over each 24-hour period are assembled into a 6 minute movie (at 24 frames/second). The final piece will consist of a large projected grid of 365 movies, each representing one day of the year, and cycling in parallel through consecutive 24-hour periods. The viewer can stand back and observe the atmospheric phenomena of an entire year in just a few minutes, or approach the piece to focus on a particular day. This will also be an active piece. The camera will continue to collect images and integrate them with the montage daily. The visualization will therefore vary from day to day, and will always display the most recent 365 days. 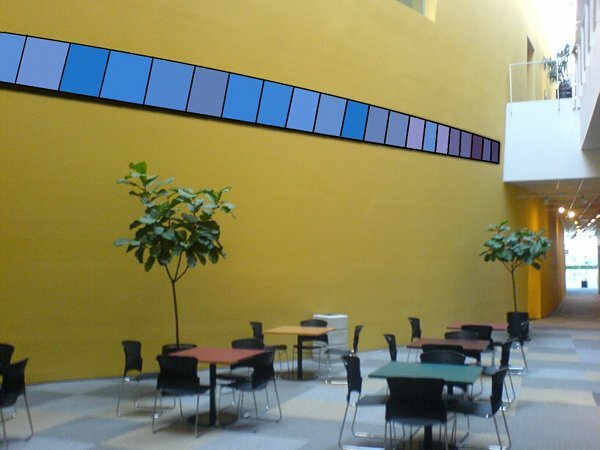 Keep in mind that all of the days are synchronized, so at any given moment, you're looking at the sky at the exact same time of day for each of the panels. The cascading effect at sunrise and sunset is caused by the variations in day length. 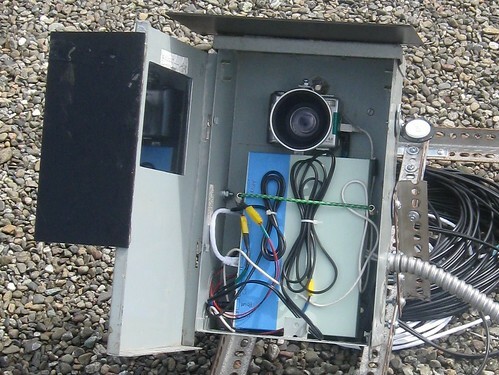 The rig consists of an old four-megapixel compact digital camera controlled by a small, low-power computer. I looked into some of the "netcams" that are available, but even the pricey ones had unimpressive image quality. On the other hand, my old Canon A520 takes pretty nice pictures. I'm trying to capture as much of the sky as possible, so I attached a wide-angle conversion lens, which fits over the existing optics. The computer is a Soekris net4801, on which I've installed Ubuntu Linux. 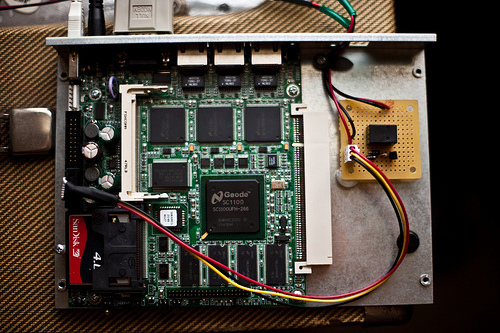 The hardware is intended for use as a general-purpose networking computer, but it works perfectly for this job, as it has a USB port, and ethernet ports (remote access is a requirement). This system has 4GB of Compact Flash storage, enough for several days' images. The software controlling the camera is gPhoto, an open-source image capture application. This all fits inside of a NEMA Type 3 enclosure, which I salvaged from a junk yard. 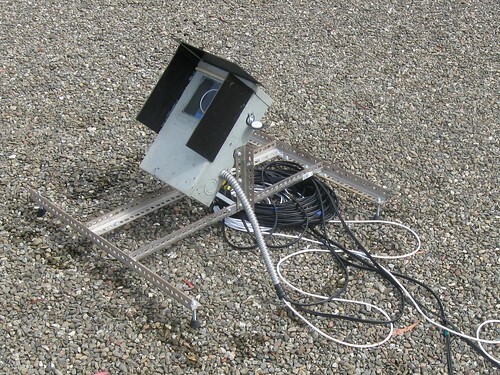 The enclosure is mounted so that the optical axis of the camera points 45 degrees above the horizon. One important factor is that the sun never enter the frame. This would complicate exposure issues, and I think the piece works best with just sky, clouds, and fog. To accomplish this, the camera is faced due north. Even with the wide-angle lens, the sun will always be just out of view. If you're interested in building your own system, check out my how-to article, "Slow Down To Speed Up" in issue 21 of Make Magazine. Images from the camera computer are are continually downloaded over the network to another system, sitting safely inside the building: a desktop PC running Linux, with a one-terabyte external RAID disk array. Maintaining uptime is important for this project. The camera computer and the camera itself run off an uninterruptable power supply. 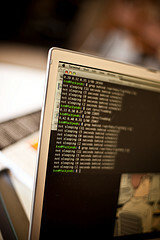 If the network is tempoarily interrupted, the camera computer can continue to store image files locally until connectivity is restored, and the downloads to the storage system can resume. This system will take over three million pictures over the course of a year. With a resolution of 1024 x 768, the image file sizes range from 100 to 200KB, which should total a bit less than half a terabyte per year. Due to the large number of images, these files need to be managed carefully, and accurate timestamping is crucial. All of the systems are configured to ignore daylight savings time, and each image is downloaded immediately after capture, and renamed according to its EXIF timestamp (the date and time info embedded in the image file). The images are organized into directories by day. This is done using custom-made tools coded in Java and Perl, some shell scripts, and applications such as ImageMagick (for resizing and montage) and FFmpeg (for assembling still images into movies).